Leopards are the smallest of the four “big cats” – tigers, lions and jaguars. They have shorter legs, a long body and large skull. Smaller and slighter than the similar-looking jaguar, leopards have spotted fur, even those that are melanistic (completely black or very dark in color). These spots serve as camouflage. 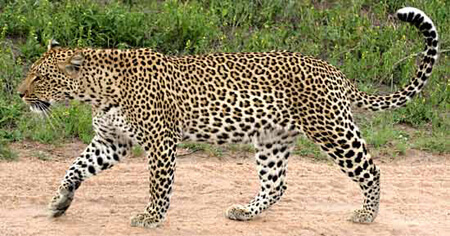 There are several subspecies of leopard that live in different parts of the world: Indo-Chinese leopard (Mainland Southeast Asia), Indian leopard (India, southeast Nepal and northern Bangladesh), North Chinese leopard (China), Sri Lankan leopard (Sri Lanka), Javan leopard (Java), Amur leopard (Russian Far East, northern China and Korea), African leopard (Africa), Persian leopard or Iranian leopard (Southwest Asia), Arabian leopard (Arabian Peninsula) and Zanzibar leopard (Unguja Island in the Zanzibar archipelago). Male leopards are much larger than leopardesses; males weigh between 80 and 200 pounds while females weigh between 60-132 pounds. All leopards are known for their agility in climbing; these cats have often been observed resting on tree branches during the day and descending down tree trunks headfirst. They’re pretty good swimmers (though not as good as some of the other big cats, like the tiger), and can run over 60 km per hour, leap over 6 m and jump up to 3 m vertically. Leopards are agile and stealthy predators, able to take down large prey thanks to their massive and powerful jaw muscles. In fact, these cats will eat almost anything, from dung beetles to monkeys, rodents, reptiles, amphibians, birds, fish, antelopes, gazelles and deer. Although at one time leopards could be found in Asia, Africa, Korea and South America, their range has been significantly decreased over the time. Now, leopards are mainly located in sub-Saharan Africa (some small populations live in India, Indochina, Malaysia and China). A solitary creature, leopards don’t often interact with each other aside from mating. Defending their territories fervently, leopards live mainly in grasslands, woodlands and riverside forests. Cats that live as far north as the Russian Far East can stand temperate forests where winter temperatures reach a low of -25 degrees Celsius! 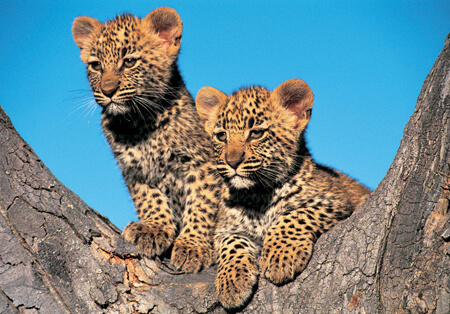 Because of hunting and loss of habitat, leopards are considered a Near Threatened species. What Are These Lions Up To? Take the gazelle to a movie. Borrow the gazelle's Lil Bow Wow CD.